Get the ergonomic seating upgrade your office deserves with the Steelcase Leap Chair, now available with an open box clearance option. 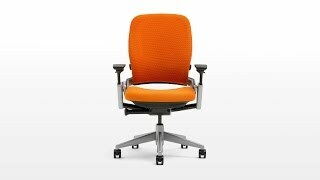 Easily one of the most well loved ergonomic chairs available today, the Steelcase Leap Chair with open box clearance is your chance to save big on one highly sought after chair. Most of our selection is black and includes high performance arms and carpet casters for easy mobility for your chair. Give us a call today to see what we currently have in stock and what's the ideal chair for you and your work style. I bought this chair after having back surgery and needing a quality chair. I've been very happy with the chair so far. I bought my eggplant colored leap chair on sale last year and LOVE LOVE LOVE it. It came in perfect shape and has truly saved my back. I highly recommend it. It's a great way to save money on a Steelcase. You can really trust the folks at The Human Solution to deliver quality products. Not only do I love the chair,but I cannot remember the last time I experienced such outstanding customer service. The chair is very comfortable and I can type much more comfortably now.